Las Vegas – city of lights or city of contrasts? Vegas was a confusing experience for me. I really wanted to like it because people told me I would, but I’m not sure I did. The strong contrast between the flat desert and the sky high buildings, the portrayed levels of wealth and the number of homeless people lining the street made me feel tired and uncomfortable, not energised and excited. The excess was exhausting. We stayed at The Venetian because I figured that if we were going to go to Vegas I wanted to stay somewhere over the top and The Venetian delivered on that objective. We arrived at the hotel and then we were in “Venice” with singing Gondoliers pretending to punt along the “canals” but I spotted a small propeller beneath the boat. The ceiling was artificial blue with artificial clouds and the best thing about St Mark’s Square was the lack of pigeons. It was weird. I was in a contrived make believe world that wasn’t endearing. Ironically it felt like I was a playing a game of poker with see through cards which seemed appropriate given the location! Overall, I didn’t find Vegas fun, I felt like someone was there to take advantage of me at every corner. Stuart thought otherwise though on account of his willingness to gamble endlessly! Unfortunately for him it was the first time he had to pay the bill (previous visits were paid for by work) and he didn’t particularly appreciate being charged a “resort fee” despite the pool being too cold in the first place. Nonetheless, for the both of us, there were some highlights. The fountain at the Bellagio and the free show at Caesar’s Palace were fun. Watching Stu posing on the side of the road, unknowingly right beside a bus plastered with near naked men was amusing (I suggested he go and audition but he wasn’t so keen!). A friend also gave us a tip to find the Secret Pizza at the Cosmopolitan. For those who aren’t in the know, follow the escalators to the top of the Cosmopolitan and follow the record lined hallway (shhh!). It was amazing pizza – we were sorry we found it on night two, otherwise we would have eaten there every day. 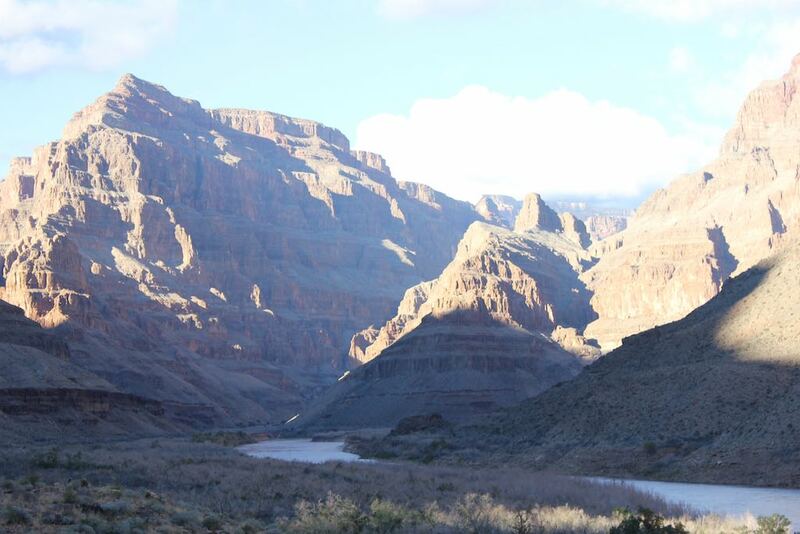 The best bit was getting out of Vegas on a tour to see the Grand Canyon. We went with Pink Jeep Tours and our tour guide was awesome. We had the best day, driving through the desert, flying through to the bottom of the canyon in a helicopter and then taking a (slightly naff) boat ride down the Colorado river. On the way home we stopped at Hoover Dam which I was impressed by too – the feats of nature followed by the feats of man. The canyon was spectacular, definitely a highlight. On our last day I was admiring the view from our room, over the empty swimming pools and then out to the desert beyond. I looked closer at the Italian style building opposite, looked again and then reached the conclusion the building was nothing more than painted canvas. On the way down to the shuttle bus, I knocked on the “marble pillars”. Sounded like PVC pipe to me. We took a seat outside the hotel to people watch until the bus came and I took a deep breath and leant back against the plastered wall. More painted canvas. Vegas – city of contrasts and city of illusion. If you are a drinker and gambler this place is for you! Yes, it’s naff but it has easily the best selection of games for any punter to play. With that said by George the prices sure have gone up since the GFC! The strip minimum bets is ~$15 for a human dealer. Apparently the old strip has cheaper entry bets but in the big casinos go hunting for the computerised dealers (focus on Blackjack, my favourite card game) as their entries are $5-10 meaning you can get free drinks and still make $100 last a night! On the club circuit check out Hakkasan Nightclub for decent doof but expensive drinks. Tiesto is resident there at the moment which means the tunes are pumping! If you want to avoid the long queues consider milling around ~4pm the night you want to go on the bridge between New York New York & MGM and find one of the promoters. He will put your name on the list which will get you into a slightly shorter queue!